Articles Tagged "Sea Level Gate"
NSW Government "suppressed sea level data"
7 News report alleges that sea level data showing smaller than projected sea level rises were suppressed in order to avoid conflicting with Federal government climate change policies. Global sea-level dropped significantly over the past year, NASA satellite data show, bucking a long-term trend toward sea-levels driven higher by a changing climate. But the drop of about a quarter inch on average does not signal a reversal of global warming, said Josh Willis, a Jet Propulsion Laboratory climate scientist who reported the latest data this week. "We expect that, within the next year or so, we'll see sea-level rising again," Willis said Wednesday. "And actually, the very latest data suggest that's probably already started." The drop is the largest in the generally upward curve of sea level measured over the past 18 years, although there have been other downward bumps. Tom Moriarty at Climate Sanity has done a thorough analysis of Stefan Rahmstorf ‘s and Martin Vermeer’s PNAS 2009 paper Global Sea Level Linked To Temperature, hereinafter RV2009, which claimed sea levels would rise 1.8 m by 2100 due to rising temperature. Turns out they used awfully “brutal mathematical contortions” and bad assunptions to reach this figure. Moriarty finds the paper is riddled with gross errors and false assumptions, read overview here. New studies have since come out that would allow Rahmstorf & Vermeer to make corrections, but they are perfectly content in letting the press run crazy with their wildly exaggerated 1.8 meter figure. Keep in mind that practically all sea level experts have called the 1.8 meter fígure hugely exaggerated, some even calling it preposterous. Even the alarmist IPCC 2007 3rd Assessment Report projects a sea level rise of 18 – 57 cm by 2100. Most skeptic scientists project it will be in the neighbourhood of 20 cm – similar to last century. So how did Rahmstorf and Vermeer arrive at such an inflated figure? Tom Moriarty explains. Plotting the global mean sea level (MSL) trends (from multi-satellite mission data) over almost 17 years from Oct 1992 - July 2009 shows a decrease in mean sea levels along most of the west coast of North & South America of approximately 50 mm or 5 cm during that period. (Above graph was created by using photoshop neutral color picker on the original graph below from the satellite data browser to alter color scaling for clarity of positive and negative trends). 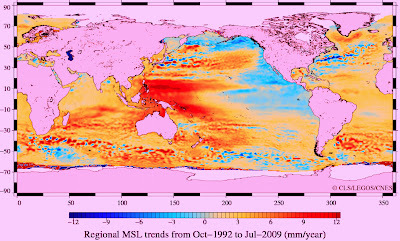 The plots show most of the sea level rise was concentrated in the equatorial Pacific region where periodic El Nino events raise ocean temperatures and regional sea level (large red area in graph). Small increases of 1 mm - 3.5 mm/yr are found at most other coastal regions during the period. Indeed, the AVISO site notes.